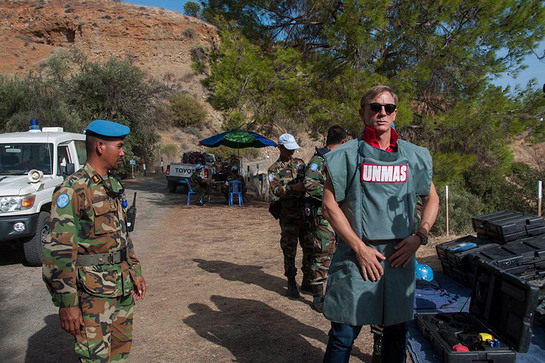 In his new role as the United Nations Global Advocate for the Elimination of Mines and Explosive Hazards, renowned actor Daniel Craig underscored the humanitarian importance of the UN’s de-mining efforts in Cyprus, his first country visit for the Organization. “Witnessing the potential impact that mines can have on people and communities, years after the end of conflict, brings home the humanitarian importance of the UN’s de-mining efforts in Cyprus,” Craig said. Daniel’s mission led him on a two-day familiarization visit with the UN Peacekeeping Force in Cyprus (UNFICYP), where he toured an active minefield – recently identified by the UN Mine Action Service. He was also briefed on mine clearance activities by Lieutenant Sovannara Leang, who leads a twenty-strong team of Cambodian peacekeepers from the UN Interim Force in Lebanon (UNIFIL). The two UN forces are deployed together as part of an inter-mission co-operation agreement. Having filmed years ago in Cambodia, the Global Advocate, best known for his role as 007 in the James Bond films was familiar with the widespread contamination of mines found in that country. Craig was impressed to see Cambodian de-miners offering their expertise to help the people and peace process in Cyprus as he witnessed first-hand the difficult and risky work in manual demining and explosive ordnance disposal by UN peacekeepers. “For these peacekeepers to take their expertise, gleaned over the last 40 years in Cambodia, and make it available to the people of Cyprus, half-way around the world, is truly inspiring,” praised the James Bond actor. Daniel also visited an area recently cleared of mines in the UN buffer zone and the UN protected area in Nicosia, where he was briefed by the Special Representative of the Secretary-General and Head of Mission, Lisa Buttenheim, and UNFICYP’s Force Commander, Major General Kristen Lund. “The fact that the UN Global Advocate chose to come to Cyprus for his first mission, at a time when demining demonstrates positive momentum in the peace process, is significant. His visit draws attention to the UN’s long expressed goal of achieving a mine-free Cyprus for all,” said Ms. Buttenheim. Over the last decade UN de-miners have removed more than 27,000 landmines from the buffer zone in Cyprus. A total of 74 minefields – or 9.7 square kilometres of land – have been cleared throughout the buffer zone to international mine action standards, set and monitored by the UN Mine Action Service (UNMAS). The cleared area can now be put to productive use. It is estimated today that thousands of landmines still remain in Cyprus, with large areas possibly still contaminated by mines and unexploded ordnance. 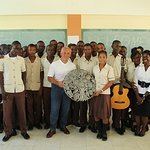 “I very much hope that I will be the first and last Global Advocate to see landmines on this beautiful island,” said Craig.